Chapter 9. ’20/20′ Papa, Watch Me Fly What a perfect special edition of 20/20. The one major thing that I absolutely adore Barbra Streisand for is the fact that she is so “exclusive”. Maybe that’s not the right word. Maybe modulated is better. But you never have to worry that you’ll hear the next day that she was on ‘The Mac Davis Show’ or ‘The Tonight Show’ and you missed it because you didn’t hear about it. When Barbra does television it is an event and you know about it. TV Guide would select a featured program on any given night that was worthy of the ‘close up’ box. The never had a program more worthy than this. 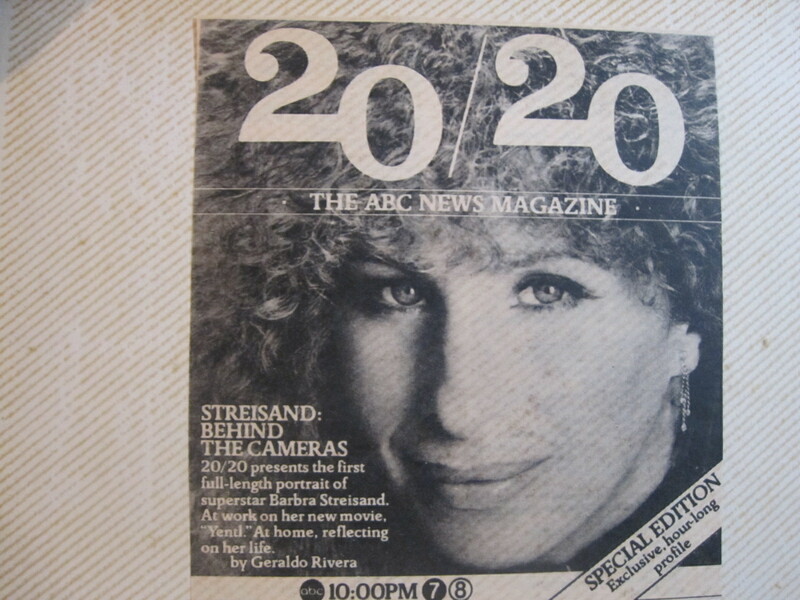 We were all so excited to hear that ’20/20′ had devoted an entire hour to Barbra Streisand and her film ‘Yentl’. John Hanrahan proclaimed that this was the reason television was invented. As I hosted the ‘Yentl’ Party the previous Sunday, Michael Mayer generously opened his home and hosted the ‘20/20’ Party. There were a few reasons for this. First and foremost he had a color television. So who doesn’t have a color television in 1983? Me for one. When I moved out from my mother’s I took my little 10-inch black and white portable. I was not in a rush to purchase a color television because I went to the movies a lot and only watched T.V. for the news and weather. Oh, and ‘Dynasty’. That’s about it. Barbra was never on television so black and white was fine. When the big ‘Yentl’ promo push started I guess I didn’t have the cash money to go out and buy a new set for the occasion. So, all those television appearances she was making would be enjoyed on a black and white set. My mother did get me a 19-inch color set for Christmas so I was able to watch the Golden Globes in color but that’s a later story. Even though I watched Barbra on ‘The Today Show’ to promote the wide release of ‘Yentl’ on that little 10-inch I have upgraded my set to coincide with her subsequent television appearances. For her 1985 ‘The Broadway Album’ interview with Barbara Walters I bought a 25-inch Fisher color monitor and had to have a roof antenna installed because seemingly monitors did not come with rabbit-ear antenna. And then in 1991 when Barbra appeared at the Oscars to present Best Picture (and officially, in my mind, kick off ‘The Prince of Tides’ promotion) I upgraded again to a 32-inch Sharp color monitor. God knows what she’ll have to do before I upgrade again to the 40-inch rear screen projection category but hopefully I have a few years to save up. So, Michael was having the ‘20/20’ Party. He always did things so nice. His kitchen and living room were combined as a large space all done in shades of white. While I make myself sick making sure I have every different brand and flavor of liquor imaginable, Michael Mayer would decide on one drink that he would serve, plus soft drinks. I don’t think many people were drinking water in 1983. We were still using it exclusively to splash on our faces or do the laundry. In a festive pitcher with matching glasses Michael served up his surprise punch. I think we had a dessert party theme. Or maybe it was a cheese party? Who knows? No, I am pretty sure it was definitely a Jewish bakery catered desert party in honor of ‘Yentl’. ‘20/20’ broadcast in New York at 10 p.m. and we probably all did whatever we did for dinner then converged on Michael’s for the show. Alex was not in attendance. He was probably having a consultation with a plastic surgeon about his knuckles. I don’t think it was the same doctor Michael used (“Oh, honey. You don’t know about Dr. Reese?”), in any event he was not there. Now with the premiere one day behind us I figured I could afford to indulge a little and put back those few pounds. People actually thought I looked too thin but that’s what happens after weight loss. All my life my mom was telling me to lose weight and now she was telling me to eat something so people wouldn’t think I was sick. The one great thing about being thin was that I was able for the first time in my life to eat food in public. I always wanted to eat an ice cream cone or a hot dog while walking down the street but I never did. What would you say if you saw some guy with a 56-inch waist eating on the street? Exactly. But now that I’m thin I try to take most meals al fresco. Where was I? Oh, okay – so Jeffrey Rindler was none too thrilled with the reception on Michael’s television. As a matter of memory, he really didn’t want to watch the show at all because he had not yet seen the movie. Remember – Rental/’Yentl’? He and I were going to the first regularly scheduled performance the next morning and he wanted to see the movie “pure”. The rest of us were as excited as could be. What can I say of that hour of television? I loved seeing Barbra look so beautiful and speaking so eloquently about her father and movie. The hour was much too short and they showed far too many commercials. I was a little upset that Barbra had not made the cover of TV Guide that week. 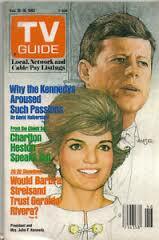 It was the 20th anniversary of JFK’s assassination so the cover was devoted to Mr. and Mrs. Kennedy. Rightfully so, I guess, but a big mistake as far as I was concerned. The TV Guide. And why Barbra didn’t get the cover I’ll never know. Let’s discuss Judy Garland. Well, let’s not but let me say this much. No, wait a minute. Let’s discuss her. No, forget that. I should move this story along and if I start with Judy at this point we’ll never get to Beshiv. I had never seen the clip of Judy and Barbra singing. I was born in 1960 and was only three and a half or so when the episode first aired. I missed so much. But I heard about it. 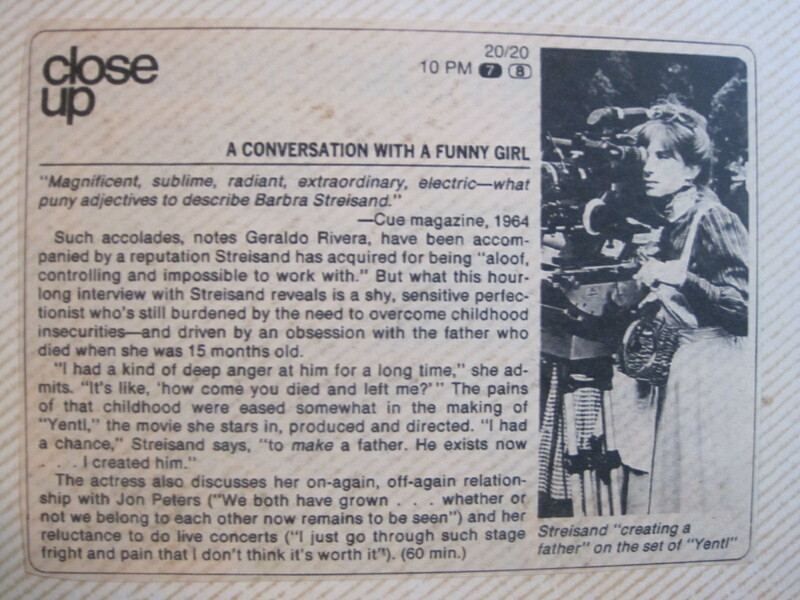 In later chapters I’ll discuss ‘Barbra: The First Decade’ (James Spada) and my Aunt Kate, but for right not all you need to know is how much I had always wanted to see that damned clip. It has a legend about it unlike anything else that has ever been on television. Jeffrey Rindler and I were both crazed to see it. I cannot tell you the amount of effort we put into trying to find and see this clip. Of course John had also been crazed to see it but as we grew older and John’s interests started to broaden I was pretty much left on my own in Barbra world. It took my quite a while to get in synch with John’s “new life”. Let’s say he was more adventurous than I in the nightlife department – we once made plans to go out at “around 2 o’clock” and I thought it was P.M. but John meant it as A.M. As in after midnight. As a late teen and young adult John used to go to his dance clubs no earlier than 2 A.M. This was very important to John. He always liked showing up “fresh and alive” just when everyone else we beginning to tire. John once rode the #1 subway from our stop (the first stop) all the way downtown standing up because he did not want to crease his pants. Now that is devotion. So while John was learning the new creaseless pants dance craze I was doing my Barbra stuff by myself. His love never dampened but at the age of nineteen when I needed to see the first performance of ‘The Main Event’ John was busy sleeping because he had been out dancing to the title song re-mix until dawn. I was a Barbra solo until I met Jeffrey. It’s so wild to meet another Barbra fan and hear their story (more on that later). Jeffrey was then every bit as enamored as I still am now. We made it our business to see that Judy clip. Rumors used to fly around the Village – Uncle Charlie’s is showing it tonight – Uncle Charlie’s showed it last Thursday – Some bar on Grove Street has it – you get the picture. I hope so because we never got it. But we would sniff out and scout down every possibility. I hate that bar Uncle Charlie’s and will never step foot in that dump again until such time that they’re closing their doors for the last time and I can have the honor of buying the last drink. Jeffrey and I would offer cash money to the guy in the video booth just to please show the clip and he never, ever would. I hate it when people think they have power just because they can say, “No”. “No” is the easiest word to say and it doesn’t make anybody a better person. Saying, “Yes, I can help you” is a lot harder to do but ultimately more worthwhile. “No” is a quick thrill. “Yes” lasts a lifetime. So we’re watching ‘20/20’ and Jeffrey Rindler is closing his eyes and covering his ears anytime something from the movie is shown. Remember, the opening day is tomorrow and he hasn’t seen it yet. Michael is serving champagne and Rugulah; John is fixing his wrist jewelry and then all of a sudden, out of nowhere and without warning, comes “the clip”. They picked it up a few moments into it, they didn’t show the entire thing, but they played it to the end and that was more than enough. The entire room went quiet. It was amazing. Simply amazing. It was fabulous. Wow. I think I was crying. Michael Mayer was crying. Jeffrey Rindler was crying. John was “misty-eyed” (as he wanted noted for the record). It was so wonderful. What impressed me most about the clip is how vibrant, healthy and young Judy Garland looked. She died in 1969 and by 1983 all the people who “mimicked” her or took her off in their acts always made her look so twitchy and nervous. But she is a master at underplaying, of understatement. It seems as if the lyrics just spill out of her mouth, without pain or effort. And what a pro in front of the camera. Towards the end of the song, on the last note, as Barbra goes to extend her arm Judy puts a clamp on that real fast, and I think on purpose. Now, Barbra was there, speaks lovingly of Judy but that’s my theory. But we all know how Barbra feels about theories. But I still say Judy knew exactly what she was doing as befits a star with so many years in the business. So, some advice to the boys plying their trade at the cabaret…a little more subtlety and a lot less tics and stop making a mockery out of a legend. I loved that show. That entire segment with Barbra looping “The Way He Makes Me Feel”, and the missing downbeat, and her look of satisfaction when it finally works out – her concentration and determination were, and are, inspiring. How many times since then have we stopped arguments by saying, “Give the lady back her book!” Don’t ask. And the looks she fires at Geraldo Rivera. “A theory.” “You want to talk to me about my love life?” “Because objects don’t talk back.” So fabulous. I don’t think any of us owned a VCR in 1983 but since then I’ve seen a VHS copy of it and it never fails to thrill me. Although I still contend that Hugh Downs cut in too early at the end of the clip of “Papa, Watch Me Fly” but there you have it. I’m difficult. When the show was over we were all in such a good mood. Upbeat. Just 24 hours earlier Marlo Thomas was snapping at us but it seemed like a lifetime ago. John pointed out that he had a roll of film that he didn’t use at the ‘Yentl’ Party the previous Sunday and maybe we should take some pictures tonight? John has always been our official photographer. Alex is also very quick with the camera. So we posed around Michael’s apartment and garden and had a blast. I can’ t believe how vain I was now that I was “thin”. At 353 pounds I didn’t care what I looked like but now at 212 (after sauna) I was very concerned. John snapped a picture of me from the side as I was combing Jeffrey Rindler’s hair. I thought my neck was a bit loose so I didn’t show it to anyone until I had given myself a “mini-lift” with WhiteOut Brand liquid paper! No, honey, I too never heard of Dr. Reese. I ran out to buy The New York Times to get the review. I actually thought I was going to see headlines “Barbra Streisand to Win Director’s Oscar” or something along those lines. I forget the review. I remember it was very snotty and not very nice. It did not upset me because I knew then and know now that ‘Yentl’ succeeds on its own merits and on many other merits as well. I think Jeffrey, who hadn’t seen the picture yet, was upset. We had seen it and knew the review was wrong. Variety loved it; Time, and Newsweek loved it. Michael Mayer pointed out that nobody reads The New York Times in November anyway because nobody changes apartments or jobs in November. Michael had the best apartment and best job of anybody I knew so I figured he must know what he’s talking about. Michael always knew how to put things in the best light. But I hope I never bump into Janet Maslin. I’ll show her what I can do with a tri-colored headscarf. Michael and John. The could have been the new backup singers for the Oreos. Such artisans. I think I took this picture off their reflection in one of Michael Mayer’s mirrored walls. I think. This was the night I started having imaginary conversations with Marlo Thomas. John told me to forget Marlo and sparkle. Completely out of our minds. John wanted to do some shots inspired by Barbra’s direction. Again, completely out of our minds. John always hated this picture, thought I didn’t give him enough time to compose his face, but it’s the only one we have of Michael Mayer’s favorite art piece, something that was called or we called “Radioactive Cats”. Michael Mayer wouldn’t get caught up in all the posturing that was going on and we always thought this pose was that of a favorite relative at a fun banquet. I always thought statues outside were only in parks or cemeteries until I met Michael Mayer. The height of nonchalance. John and Jeffrey Rindler. John thought it was “high-art” posing with this bit of garden pottery. Jeffrey Rindler, the night before ‘Yentl’ opens, running from the townspeople, no doubt. Prepping Jeffrey Rindler for his photo shoot. I didn’t like the way my neck look so I did a little retouching. Wouldn’t you?